Since the XVI century the ‘cotton deer’ became the Batsi Chij or the “real sheep” and its “cotton” – the fleece- became the raw material of the traditional wool dress which is a symbol of the Chamula identity, and an important income source for their households. The same sheep are now known as the “Chiapa” sheep, and have become sacred animals to the Chamula people and are treated as treasured pets. A ‘deer covered in cotton’ is a poetic image, but the social, economic and cultural importance of the sheep and its wool goes beyond poetry for the Chamula women, who are in charge of the animal care and have the responsibility for the processing of the wool and the weaving. This wool is unique to Mexico: almost 500 years of breeding, practiced by the shepherdesses and the indigenous weavers have created a highly specialized product. It is hand spun, resulting in a yarn of uneven thickness, infusing the fabric with its characteristic texture. Because the wool is not being treated industrially, it retains its natural luster and allows for vibrant colors to be achieved during the dyeing process. All the wool we use in our creations is spun by hand with a pre-hispanic drop spindle by around 60 indigenous Chamula women from different villages in the highlands of Chiapas. 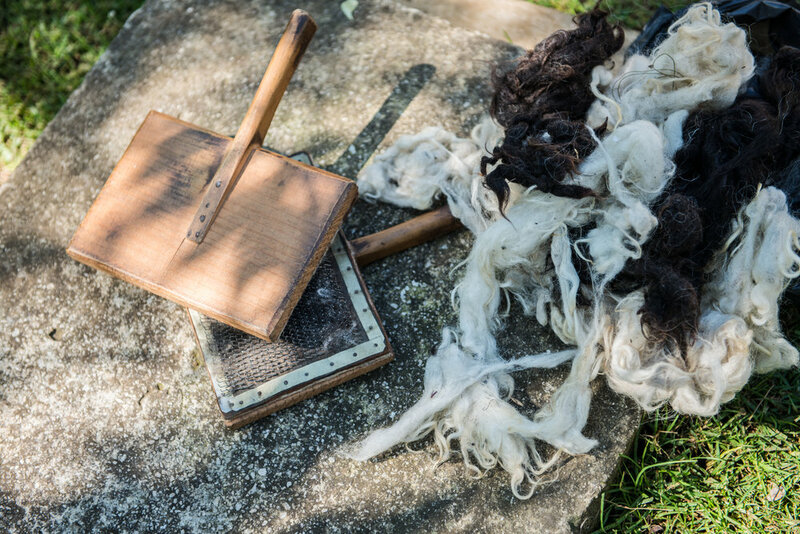 It is very labor intensive work for example, it takes more than 20 hours to process 1kilo of wool and often a rug will have more than 20 kilos of wool. We have developed together with the cooperative El Camino de Los Altos a palette of shades of gray mixing the different colors of the fleeces and we work closely to improve the quality and cleanliness of the threads, streamline the process and facilitating the work of the spinning. Due to our growing demand for raw material, this year, 2018, we have resumed the collaboration which started many years ago with three additional spinning groups. We are committed to ensuring that our demand is constant in order to guarantee a stable source of income for these women.